In our last blog post, we discussed the top of the marketing funnel. That is, how do you measure the volume of visitors and leads to your product? In this second post, we will zoom in on the next step in the funnel: lead nurturing. So, what is lead nurturing? Which tools exist for this process? How do you know if a lead is ready for the next step towards becoming a paying customer? In other words, how do you measure how engaged your leads are with your brand, your product or your content? Let’s break this down step by step. At the end of this post, you’ll have a better view on what lead nurturing is, which tools to use and how to get more insights into a lead’s engagement with clear, interactive dashboards. On average, 50% of your new leads are not yet ready to buy. They need to be nurtured first, but what does that mean? Lead nurturing is the process of engaging leads with relevant information at each stage of the buyer’s journey. Typically, you’ll approach leads with different messages in time, and fine-tuned to the buyer’s interests and preferences. Now, how do you know which leads are not at all ready to buy or, on the contrary, on the verge of buying? The answer lies in your marketing automation data. Measuring the engagement of leads has become quite easy with marketing automation software. Many marketing automation tools work with a mechanism called lead scoring. Leads gather points based on the actions they take. For example: a lead opens your email and gets 2 points. Clicking on a link in that email would add another 5 points. If the lead downloads a whitepaper, he’ll add another 15 points. Starting a trial boosts their score with 50 points. We won’t go into too much detail, since there are many good sources on lead scoring. Basically, you can attribute points based on how valuable each action is for your company. 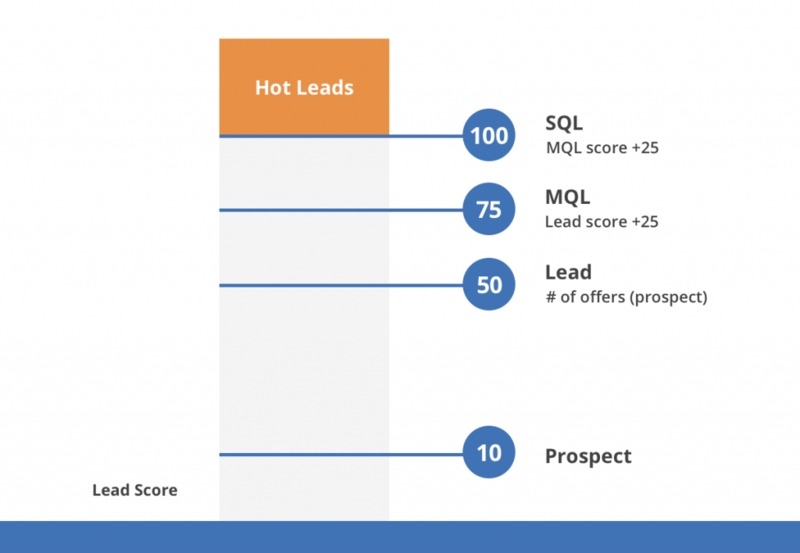 The total lead score is a sort of ‘hotness score’ of how likely your lead will buy. Now, although marketing automation tools help you with lead scoring, they often lack reporting tools to find trends & insights in engagement across your lead pool. That’s why we’ll further break down the metrics and categories to explore your lead nurturing data in this article. If you’re active in the marketing automation landscape or MarTech in general, the example dashboard may be of inspiration to embed a similar dashboard in your marketing SaaS platform. What are the key metrics for lead nurturing? Lead score is a crucial metric to track engagement of your leads. However, other metrics will help you break down that lead score in more detail. For example, what are the exact actions users took to get to this score? Did they mostly open emails, or did they take more down-the-funnel actions like a signup? Furthermore, you can analyze which factors have an influence on the lead score: are there differences per country or per marketing acquisition channel? The KPIs below will give you an idea of the basic KPIs to measure and a few categories to further drill down. This should have you covered to do a first deeper analysis your lead nurturing process. How to build a lead nurturing dashboard? Once you’ve selected the proper lead nurturing KPIs, you can gather them all in one place: your lead nurturing dashboard. This will be your one source of truth to analyze your lead nurturing activities. Whether you build a dashboard yourself as a marketer, or integrate it as a marketing automation vendor, you’re probably curious to see an example, right? Play around with the embedded dashboard below to get a better idea of what it can look like! How to use the lead nurturing dashboard? Your dashboard is ready, but that doesn’t mean your job is done. This is where the real stuff begins: finding valuable insights in your marketing data! The goal of your dashboard is to help you make better marketing decisions. Now, how do you start gaining insights from a lead nurturing dashboard like the one above? We’ll dive into an example use case below. Have a look at the lead score filter on top of the dashboard. Engagement of the leads in your bucket goes up to 289 points. Those are your top leads, and you’ll want to have more of those! If you filter the dashboard to show only leads with lead score higher than 240 points, you’ll be able to drill down on your top leads only. Let’s see if they have some common characteristics. The ‘Back2School campaign’ shows good results: leads that found us through this campaign have the highest amount of trial signups, email engagement ánd content downloads. Social media seems a qualitative acquisition channel: leads acquired through social media had the highest number of trial signups, website visits and content downloads. This can help you make the decision to create new campaigns that resemble the Back2School campaign, or to put more efforts into social media. You can do exactly the same for the least engaging leads, and spot similarities there. In that way, you can optimize your marketing mix and campaign content to fuel your leads with the content they love most! If you’re using a marketing automation tool, you download the data from that tool and build your own lead nurturing dashboard. However, wouldn’t it be much easier if this dashboard was available inside the platform itself? As a marketing automation platform, you can easily connect your platform to Cumul.io’s analytics software via API & build dashboards for your customers. You can even integrate these dashboards into your own application, so your customers have more insights into their lead nurturing at all times, directly inside your own platform. Are you running a marketing SaaS platform and interested to learn more about dashboards for your platform? You can have your first embedded dashboard up and running in just a few days! Get in touch and we’re happy to show you.